Great to see last year's Alantra Pharma Fast 50 Outsourcing winner, Simbec-Orion, kick off the year with an investment from CBPE. We weren't surprised to hear there was a lot of competition to back Ronald and his team, and to support their growth plans. Growth in outsourcing remains strong, especially for providers working with small and mid-sized clients like Simbec-Orion. In this space, the combination of increased venture capital funding fuelling drug development from “virtual Biotechs”, which don’t have inhouse capacity and therefore have to outsource development, as well as a larger proportion of new drugs coming from small and mid-sized pharma, which tend to prefer the hands-on full service of a mid-sized CRO like Simbec-Orion to that of the large players, is driving double digit market growth. Simbec-Orion has capitalised on this handsomely by combining the tailored and bespoke offering of a smaller provider with the full service range expected of a large CRO, allowing it to grow at impressive historic rates of 28%. Backing by a house with strong pharma and buy and build credentials, like CBPE, makes for an exciting next step; expect Simbec-Orion to make acquisitions to complement its already strong organic growth. Keep an eye out later this month for this year's Alantra Pharma Fast 50 to see if, and where, Simbec-Orion is ranked this time around. 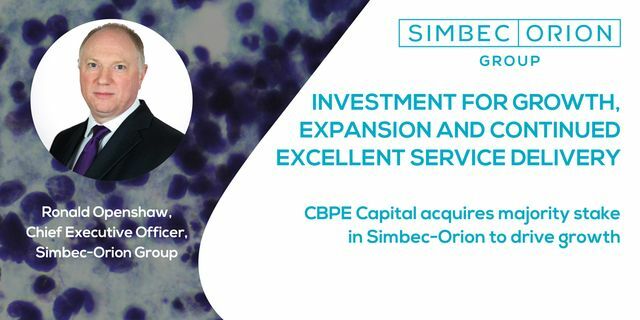 Simbec-Orion Group Limited (“Simbec-Orion”), a leading European full-service boutique clinical research organisation announced today that CBPE Capital LLP (“CBPE”) has acquired a majority stake in the company. The investment, made through a management buy-out, will provide funding for further international growth and expansion by Simbec-Orion. The investment made via the £459m CBPE Capital Fund IX, acquired the shareholding of the Wales Life Sciences Investment Fund LP (“WLSIF”) managed by Arix Capital Management Limited, a subsidiary of Arix Bioscience PLC. The financial details of the transaction have not been disclosed. Simbec-Orion was formed by the merger of Simbec Research and Orion Clinical in June 2014, funded by WLSIF having acquired Simbec Research in May 2013.